OS X Sierra Error - "Mixer System Not Initialized"
This topic is 5 months and 6 days old. Instead of replying, please begin a new topic, or search for another related topic that may be more suitable. Could anyone provide some insight/possible fix? 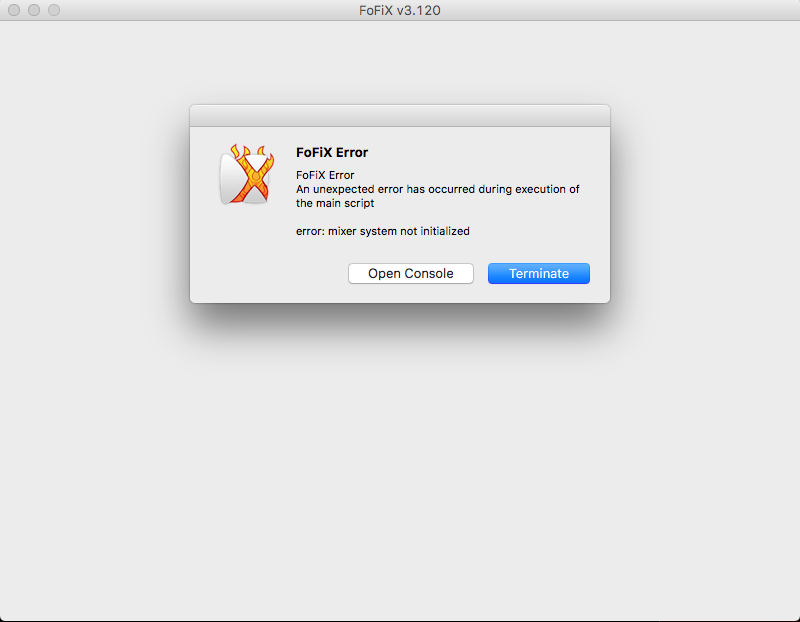 I believe that is the latest version of FoFiX available for Mac. Last edited by Comfort_Eagle on Wed Oct 12, 2016 6:59 pm, edited 1 time in total. Re: OS X Sierra Error - "Mixer System Not Initialized"
Same problem for me. I reloaded my OS to Mountain Lion and that worked but once I upgraded it's back to doing the same stuff. Yeah, I have the same error on macOS Sierra. I would also like someone knowledgeable to chime in, cause I miss my FoFix. Any input is welcome:-). Alright guys, get these two files: https://www.dropbox.com/sh/52cbfr2vytsq ... vyt3a?dl=0 and https://www.dropbox.com/sh/vsb4or952ff5 ... M5s3a?dl=0 and merge them in the Frameworks folder of FoFix. To get there right click FoFix.app and choose show package contents. Then open frameworks and merge the two files. I repeat, merge, not replace. This works for me and i can run and play FoFix again. Enjoy:-). Last edited by Dodgers123 on Sun Jan 15, 2017 5:09 am, edited 1 time in total. Works so far for me, Dodgers. Thanks very much; I'll report back if any more problems arise. Help me please, I also have the same problem, how do I fix, where do I copy the files in the frameworks folder, or the root directory? Thanks for those 2 files, such a life saver! Which version of FoFiX are you using for me to reproduce this issue, please ? I'm using latest stable release 3.120 with python 2.6. The 2 files are a merged update to the, at that point, latest python. I'm actually surprised it still runs. BTW, do you have any info on a 64-bit update on it's way, in any shape or form? Otherwise I'll have to see if I can get it running in wine or crossover or the like:-).